The daughter of a Norwegian immigrant active in the Nonpartisan League, Cornelia “Coya” Gjesdal grew up on a small North Dakota farm, graduated from Concordia College in Moorhead, Minnesota, and studied opera at the Juilliard School in New York before returning to the Midwest to teach high school music and English. 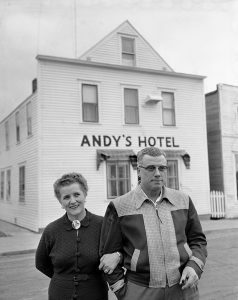 In 1940 she married a shy, simple-minded farmer named Andy Knutson and settled in a wood-frame home in Oklee, Minnesota, lit by kerosene lamps and insulated in the winter by snow banked against the walls. Inspired by Roosevelt’s speech, Knutson started her political career by calling a meeting of Oklee farmers to discuss bringing electricity to the area. 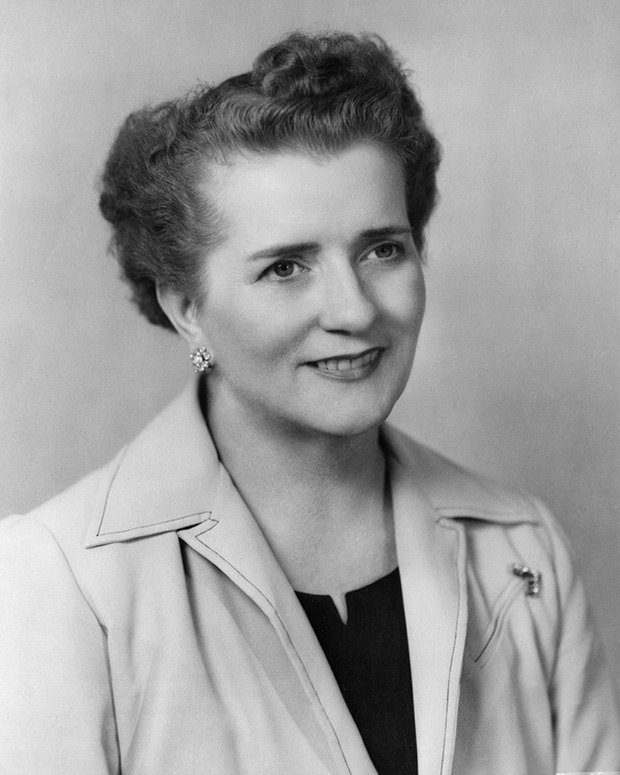 Over the next eight years, she continued to grow her political profile, advocating on behalf of small farmers, and in 1950 she ran successfully for the Minnesota House. In 1954, spurred partly by a desire to escape the turmoil of her marriage, Knutson defied DFL Party elders, who refused to endorse her, and waged an independent run for Congress. She was a folksy and tireless campaigner, attracting voters by accompanying herself on the guitar, accordion or piano as she sang songs like “The Happy Wanderer.” Walter Mondale remembered her as being a “sparkling, exuberant, bubbling, happy Scandinavian — heading for the moon.” She upset six-term Republican Harold Hagen, surprising the state’s pundits. The culture and glamour of Washington suited Knutson. 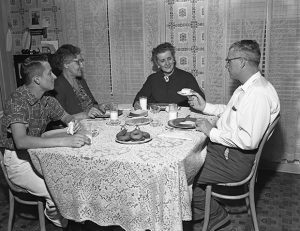 She dined with the Eisenhowers and became the first woman ever appointed to the powerful Agriculture Committee. She dyed her hair blond, worked seven days a week, charmed reporters by sharing her lefse recipe, brought Terry along to galas and called her constituents on their birthdays. Her legislative achievements were significant: She established the federal student loan program and championed family farms, campaign finance reforms and funding for cystic fibrosis research. Her overshadowed husband’s resentment grew toxic. When Knutson first left for Washington, Andy had brandished a shotgun at her and Terry. “You think you’re leaving, huh?” he’d said, only lowering the weapon when he saw the terror in their eyes. On return trips to Oklee, Andy beat her so violently that she was forced to wear sunglasses to hide her black eyes from colleagues in Congress. Her attempts to place him in an in-patient alcohol abuse center failed but — for reasons of time, money and politics — she declined to pursue a divorce. Were she alive today, her biographer said, Knutson might have taken a personal interest in the outcome of next month’s election. “A woman running for president would have pleased her,” Beito said. Read Gretchen Urnes Beito’s biography “Coya Come Home” about this courageous and accomplished woman. 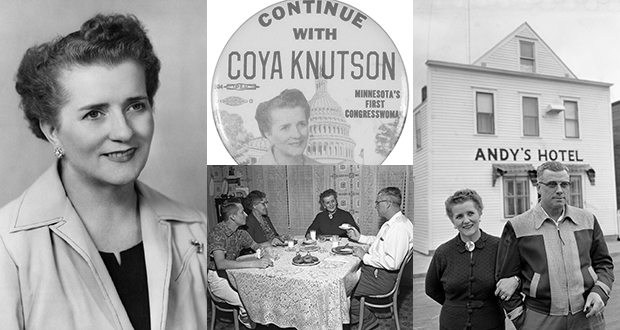 The recently updated version to celebrate Knutson’s 100th birthday includes a foreward by Vice President Walter F. Mondale, and reveals the mastermind behind the “Coya Come Home” letter.